We continue our series highlighting the American Juke Box/Harlem Hit Parade/Race Record/Rhythm & Blues chart hits by a selection of the biggest stars of the 1940’s and 1950’s swing, jazz, jump blues and R&B scenes. Most of these performers have never had their biggest hits compiled in one place. Louis Jordan needs no introduction being one of the most influential and successful R & B artists of the 20th Century. In his lifetime he had 54 top 10 hits on the R&B chart, second only to James Brown. 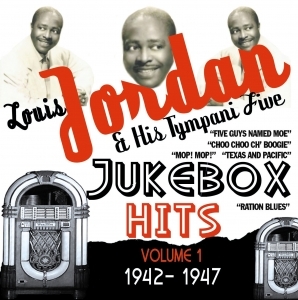 There are many Louis Jordan CDs on the market but none so hit-packed as this and its companion volume. Like our other collections this features all the 78s that were money-spinners on Jukeboxes across the world.